a measured capacity of 50 oz. 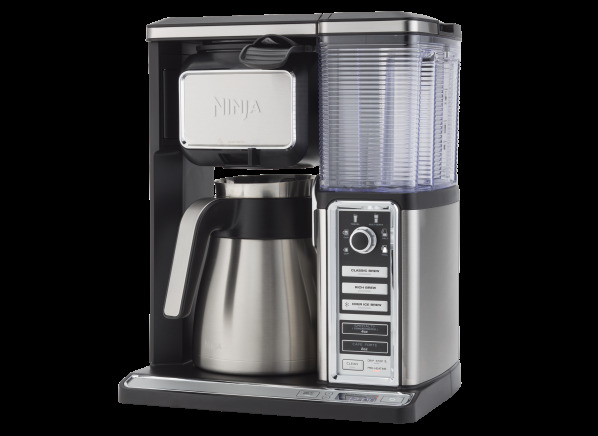 The Ninja Coffee Bar System CF097 is part of the Coffee maker test program at Consumer Reports. In our lab tests, Coffee maker models like the Coffee Bar System CF097 are rated on multiple criteria, such as those listed below. Brew performance: The ability to reach 195° to 205° F for five or six minutes, the industry standard for optimal brewing and an indication of the coffee's concentration. Results in the following chart are gathered from Consumer Reports’ 2018 Summer Survey of 42,774 drip coffee makers, owned by members who purchased a new machine between 2008 and 2018. Our predicted reliability ratings are based on a statistical model that estimates problem rates within the first 4 years of ownership, for blenders that are not covered by an extended warranty or service contract. We also adjust for the median number of days of use per week. The median in our survey was 7 days per week. Higher ratings are indicative of better reliability. Brands receiving a red or orange rating cannot be recommended by CR at this time. Our owner satisfaction ratings are based on the proportion of members who are extremely likely to recommend their coffee maker to friends and family. Programmable Programmable Programmable models have a clock and can be set to brew at a specified time. Thermal carafe/mug Thermal carafe/mug Keeps coffee warm for about four hours; thermal mugs don't hold heat as well. Small-batch setting Small-batch setting Claims to let you make a partial pot without compromising coffee quality. Brew-strength control Brew-strength control Adjusts brewing time to make weaker or stronger coffee. Dispenser-style Dispenser-style Dispenser models, which we call self-serve, hold the brew in a heated tank; you fill your cup by pressing it against the dispenser lever. Dimensions HxWxD (in.) Dimensions HxWxD The height, width, and depth of the coffee maker, in inches. Measurements are rounded up to the next whole inch.